"...But if Toronto is a competition, then city officials are dedicated to ensuring it’s the only one in the world where everyone loses." Hi. It's been over 10 months since my last update. In the past year, quite a few things have been discovered in and around (but mostly under) Toronto. I'll briefly share some of the more memorable trips, but will be intentionally vague. Sorry. This Sat is the Cowhunt, an urban adventure where you can solve clues, photograph yourself at the clue location, and race to the finish line for a chance to win prizes. It's a great way to explore our city. Tickets are $40 for a pair of cowhunters and you can register at http://cowhunt2.eventbrite.com/ where you can also find the rules and other details. Hope to see you at the hunt! 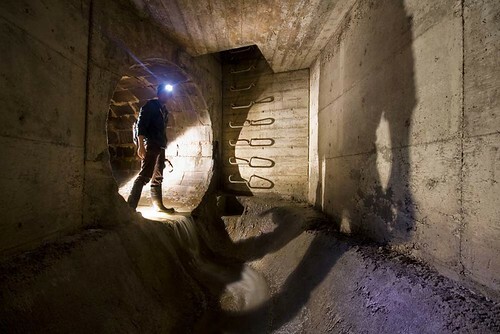 Here's a look at a some old systems underneath the city's older neighbourhoods. Today this stretch is completely submerged in the water of the Don and sewage is redirected to Ashbridges Bay Treatment Plant. 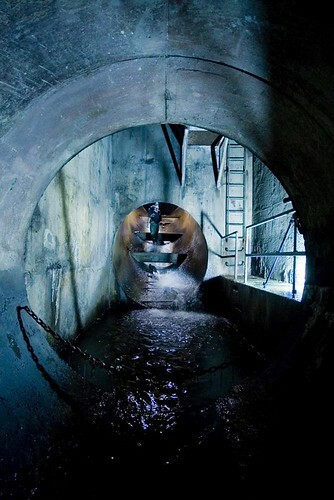 The sewer follows the path of the former Rosedale Creek in a lovely yellow brick pipe just a few metres beneath the surface and travels under landmarks like the Rosedale Subway and the site of Simcoe's summer home. 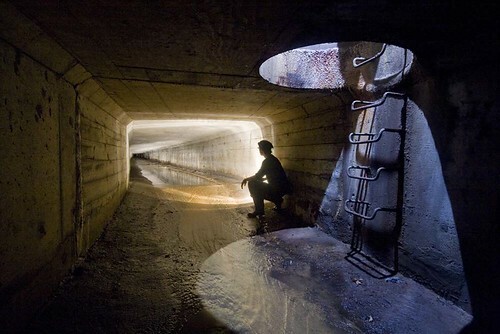 In the land of Etobicoke, there are two major creeks that guard the boundaries of the former city. Etobicoke Creek on the west and Mimico Creek on the east provided the built environment with two watersheds to service storm water and provide green landscapes like Centennial Park and West Dean Park. What most people don't know is that there used to be a collection of smaller, less significant creeks along the shoreline that vanished during the process of urban development. When the built environment takes over these natural waterways, they never simply disappear, but need to be buried. Creeks and streams exist because of things like changes in land grade, and even if the surface is paved with asphalt and concrete, rain water will still cause the ravines to flood. Instead of having our streets pool with water everytime it rains, storm drains have replaced the creeks and streams by collecting rain water through a vast series of runoff pipes found in numbers on every road. To look at this process historically, I supposed you could say that bridges over a waterway were the first method of overcoming the imposing natural configuration. 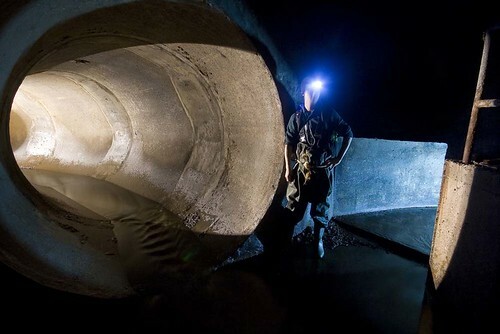 Over time these structures became more sophisticated and designs like culverts were implemented until it was decided that the speed of progress declared the water an inconvenience and was doomed to be buried. Back to our story. 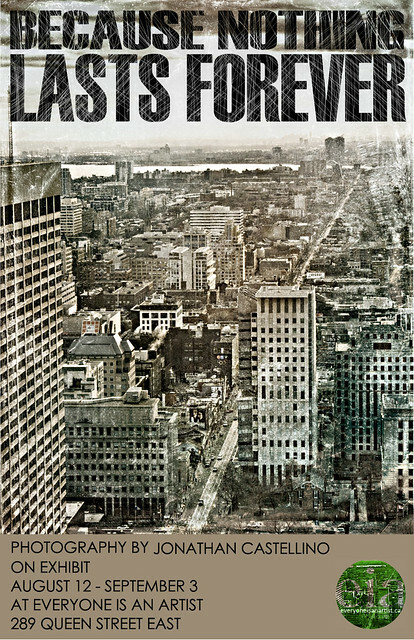 Late last year, some drain colleagues of mine and myself thumbed through a newly released book, HTO (Coach House Press) that had an essay about the lost rivers of Etobicoke. This gave us some vital clues to where some larger pipes in South Etobicoke might be. My colleagues rifled through municipal documents and created retromaps of where these creeks might have once existed many years ago. The first discovery along the eastern edge of Etobicoke wasn't much to brag about, but later on the other end, a pipe of both historical and aesthetic significance was found. The Colonel, named after a noble former land owner, is filled with different generations of drain construction. Back in May, some bricks were found under an old neighbourhood in the west end. 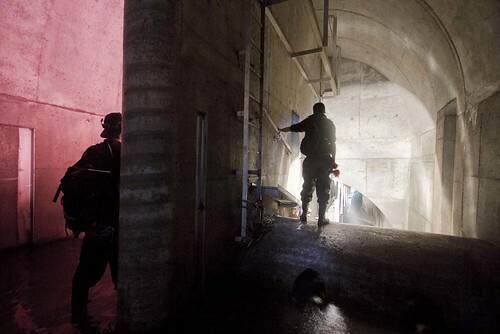 The system is sandwiched between two modern connections of waste water relief holding tanks and a large concrete diversion pipe, respectively. Two trips to two different parts of the city following two different hunches. The results also included hunches of a different variety. Two very different drains this week. The first, a seemingly boring suburban drain that has some funky surprises. Secondly, Park Drive, immortalized by the exploring spirit of Ninjalicious.